IDK why they keep reviving those damn things. They represent the worst era in Sac KINGS history and were a freaking mistake as the manufacturer got the damn color wrong. Never been part of our team colorwheel. I so HATE them. My pet peeve is they constantly refer to color as baby blue not powder blue. I can accept the later but the former implies weakness more than strength. Meh. Who cares, they are weak looking jerseys, but they are way better than those maloofey gold alternates we were all subjected to years ago. Could be worse. While I agree with you about the GOLD's, I still think I hate the powder blues worse. Odd thing is, I'm a UNC Tarheel fan and love their Carolina's blues. And while they aren't my favorite team, I've always liked the SD/LA Charger's powder blues. But the Kings just never looked right, especially with the red. These are really uninspiring. The Kings' marketing department needs to take notes from Miami and Minnesota, who turned up the color and the fun with some pop culture-infused looks for their "City" jerseys. Personally, I'd love the Kings to look to the future in some way with their aesthetic. I prefer the new logo to the previous one, but it's still a nod to the past, just like these new jerseys are a nod to the past. What's more, that particular past doesn't even represent "the good ole days" for Kings fans with long memories. I'd have to disagree and say that minnesotas prince inspired jerseys are putrid lol. Just one man's opinion of course. So you want to cut all ties to the past? I couldn't possibly disagree more. The color is an integral part of the history of the Kings in Sacramento. It doesn't matter if it was "the good ole days" - those jerseys are what the Sacramento Kings wore on the road for our first 5 seasons according to Wikipedia. Reggie Theus looked good. Far better than last year’s version. But I hate uniforms with no lettering and just a logo on the front so that just may be a “me” thing. I don't care for UNC and don't mind the powder blues but the royal would be dope. Seeing the Miami jersey it makes me a bit jealous that Sac doesn't have something so iconic to make their city jersey anything other than a throwback though. Also Portland's rip city with a sash is a total missed opportunity to not do a PDX carpet jersey, even if the carpet was retired several years ago. Even a Portlandia of some sort would be cool, as much as I resent how much that show has driven gentrification of my adopted city. Boston's jersey is unremarkable but my favorite of my 3 "home" cities. But they were a mistake. A mishap by the manufacturer. Combine that with the fact that those years (sans 1985/86) were among the worst in the SAC era and that the royal blues look much better (and were the actual team colors), it doesn't make much sense to me to keep using them. I'm willing to bet if a poll of KINGS fans was taken, the royal blues would get more votes than those powder blues. Isn't the point of these alternate jerseys to drum up more sales? Isn't it to give the fans what they want and/or to drum up nostalgia for the good 'ole days? Admittedly, the franchise wasn't much better during the royal blue days (except we had Mitch!!) but at least those were the true colors of the team. FWIW, you know what color I don't see in the uni pictured above? What's the story of the error and how have I never heard it until today? It doesn't matter if they were a mistake. It's what the team wore. Kings marketing guy somewhere: What if we made our jerseys in the Ladybird font or something? Yes, absolutely, that's the color they wore. For me, it invokes memories of some really bad teams, and I would NEVER buy anything Kings with that color. The effort to invoke nostalgia by using that color is misguided (and I'm proud to report that it didn't take me too long to come up with an adjective that would get past the profanity filters). Totally agree. But I'd buy the royal blues (or home whites) even though they sucked wearing those too. LOL. Mitchell and Ness has bought back our 98-99 Alternate and 00-01 Road Jerseys for purchase online recently. In my opinion these are our greatest jerseys ever and it maddens me to no end to see us still marketing the baby blue. I want a modern version of the black/purple combo with checkerboard down the side. I was lucky enough to buy an authentic Mitch checkerboard from the team store after the last home game of the season (1996ish, I believe). They were discounting all their merchandise. I got what was a $100 jersey back then for $60. Wish I had bought a Corliss jersey too. Anyway, I dug those combo jerseys from the very first time I saw them. I know this is an extremely unpopular opinion among Kings fans, but to me the only thing the early 2000s uniforms have going for them is nostalgia. I loved those teams, its what made me fall in love with basketball, but I just dont think they had the best jerseys. I'd honestly love to hear opinions on this. What is it, besides the nostalgia of the good ol' days, that makes those uniforms stand out as the best? Why can't the nostalgia be enough? They evoke fond memories for those of us who were around back then, cheering moral victories and reveling in the free Arby sandwich after a win. 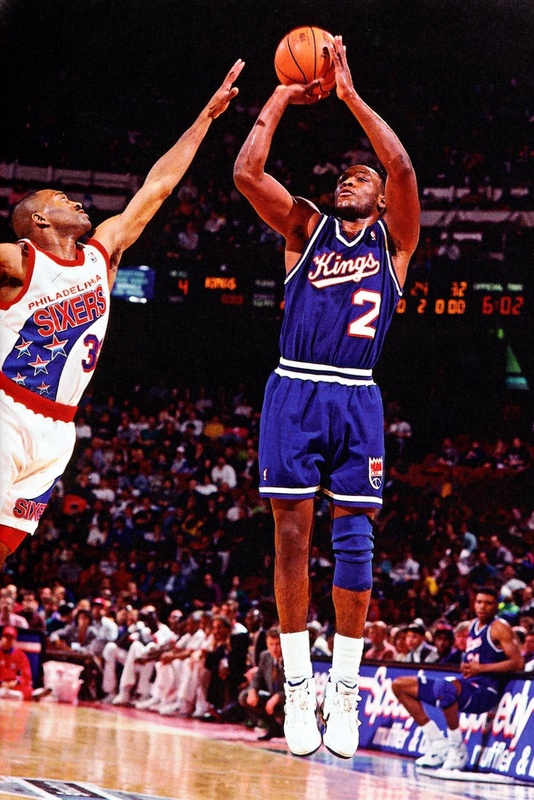 I think the Kings definitely had the coolest of all those goofy mid 90s jerseys that came out around the same time. Still love the checkerboard pattern there. reveling in the free Arby sandwich after a win. Why'd you have to go there? Now I'm hungry! Don't get me wrong i think they'd make an EXCELLENT "city edition" uniform for exactly that reason. I think a city edition should bring out that emotion and that nostalgia. But I'm just talking about the ranking of the kings best uniforms. Honestly just curious what it is that makes people love them. Maybe its the simplicity, or the silver and purple trim around the collar and arms, or the single stripe down the shorts. Then again, maybe its just the nostalgia and thats enough. You watch your mouth. Hate speech is not tolerated around here. Hold up you're lecturing me about the baby blues but you're bragging about your checkerboard jeresey there Fresh Prince?